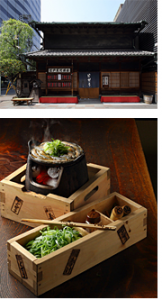 Our restaurant began operating at its present location in 1801 during the rule of the eleventh shogun, serving “dojo” or Japanese loach—a favorite dish among the townsfolk—to visitors to the famous Sensoji Temple in Asakusa. For six generations we have continued to serve dojo cooking, while attempting to preserve the atmosphere of the Edo Period. Although our building has been burned on three separate occasions, the restaurant itself is the original wooden structure almost unchanged from when we began operation, so our customers may enjoy a true touch of old Edo.